BMW tuning fans rejoice: Tecnocraft introduces its first major step into European mass-market product in their release of the TECNOCRAFT E9X ///M3 ENVY™ Intake System. Designed from the ground up, all in-house, with a performance build strictly in mind, the dry carbon fabrication team set to work in producing the most comprehensive quality intake system BMW E92 ///M3 owners (and would-be owners) have ever seen. This completely modular system consisting of four, separate and equally functional, pieces fabricated in 100% Dry Carbon (or in Carbon/Kevlar special edition for an added cost) can find its way into your ///M engine bay over time. The complete ENVY™ Intake System gains horsepower and increases throttle response on both the dynamometer and real world use, as expected in all functional ram air intake systems – forward motion at over 60mph brings the performance of the ENVY™ to life. 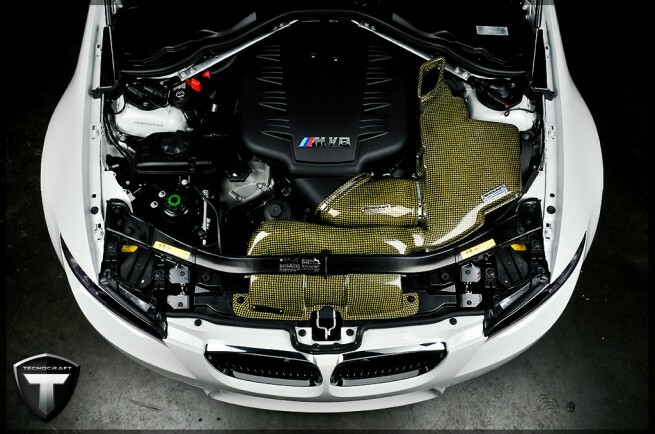 -Stage 2 of the ENVY™ intake system is a direct drop-in replacement of the plastic transition pipe on E9X ///M3s. The main advantages of the ENVY™ Transition Chamber is the smooth delivery of intake charge from the RAM Air Scoop by its elimination of unnecessary notches and choked design points leading into the factory ///M3 airbox. Forced air makes its first contact with an organically designed transition chamber, which allows airflow from the ENVY™ Ram Air scoops to be naturally reservoired and transitioned smoothly from left to right. All unnecessary turbulence was eliminated in the ENVY™ Transition Chamber’s design and conforms to extremely tight tolerances to provide a dramatic volume increase to charged air. 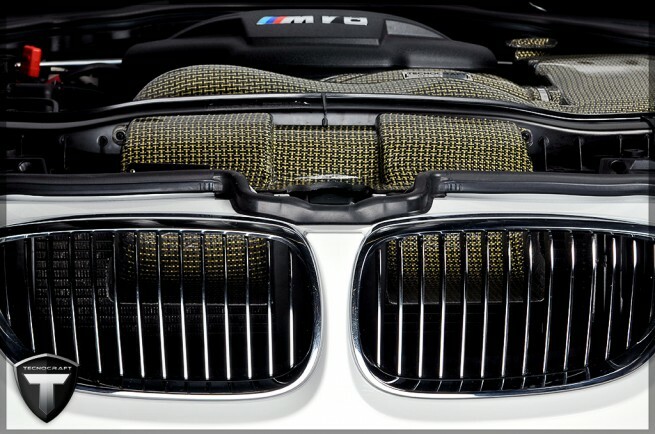 -Stage 3 of the ENVY™ intake system is a direct replacement of the factory airbox cover on E9X ///M3s. While we consider the factory intake box design made available by BMW to be sufficient, another necessary step in a complete ENVY™ intake system was development of an Enlarged Intake Cover without the many unnecessary points of intake turbulence while also increasing total airbox volume by 30%. Our Enlarged Intake Cover design carries charged air in greater volume from the Transition Chamber up and over the factory or BMC filter (optional) smoothly, hindering disruption from air filter structure as much as possible before reaching the ENVY™ ChargePipe. Factory fitment in a 100% Dry Carbon product was necessary to ensure hood scoop function remains available to the entire airbox as well. 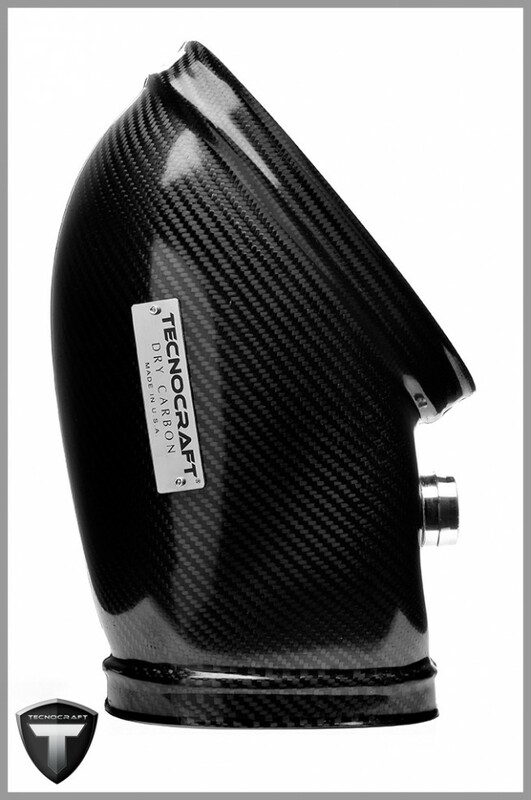 With organic design elements taken from the highly praised TECNOCRAFT Lamborghini Gallardo ‘Hi-Flow Intake System’, keeping optimal airflow dynamics was a primary concern – having also been developed in 100% Dry Carbon, our intake systems are natural heatshields and do their part to greatly reduce heatsoak. All parts of the ENVY™ system have been enlarged by at least 30% in volume, designed with smoothly transitions, and reduced in weight (if not all three at the same time) to ensure every ounce of horsepower can be gained while naturally aspirated. PYSpeed is the exclusive distributor for Tecnocraft and more information can be found on their website.